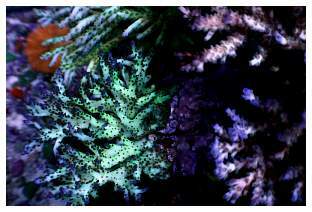 After years of visiting Reef Central and getting my monthly Tank of the Month "fix," receiving an e-mail telling me that one of my tanks was to be honored seemed like a joke. 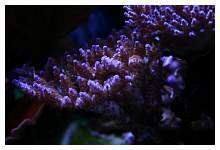 I thought maybe Reefkeeping Magazine was starting some "Honorable Mentions" in its Tank of the Month feature. 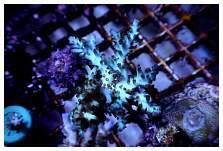 I was flattered to find out that my stony reef would be featured just as some of the previous Tanks of the Month that I'd idolized. This journey started for me while at UNC, when my girlfriend bought me a freshwater betta in a small bowl to go on my desk. 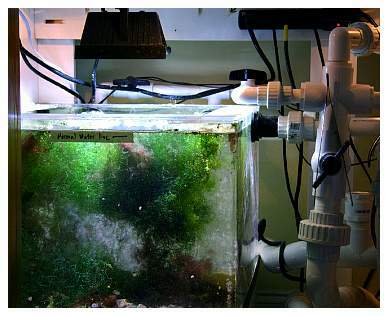 That quickly turned into a 10-gallon freshwater tank that offered me countless hours of procrastination from my studies. 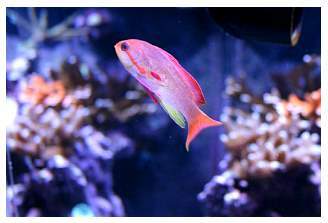 During my first summer home after college in '96, I was visiting a local fish shop and began to notice the more brightly colored fish in what, I was soon to find out, was the saltwater section. 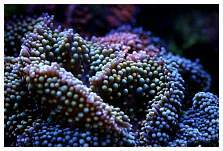 And so it began, my love for reef aquaria. The early days were sketchy at best. 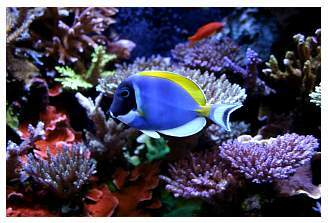 Unfortunately, my only understanding of how to operate a saltwater tank was learned through trial and error. A few years later, the Internet boom allowed easy access to information from fellow hobbyists, and successes in the hobby ensued. 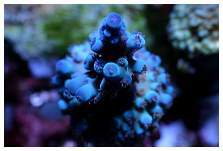 I have run several saltwater tanks over the last 10 years, and I read pretty much anything and everything I can find about the hobby. 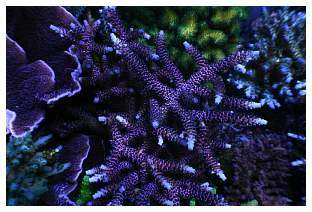 The accumulated knowledge and experience are what led to the stony tank featured herein. 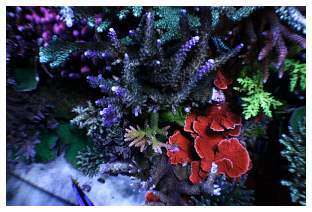 I wanted a larger reef tank to be the centerpiece of our family room. The space available for the tank was measured and a call went in to GlassCages as quickly as possible, before my wife changed her mind. The stand's and canopy's construction was arranged from a local custom furniture builder. 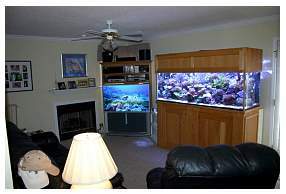 A few months later a large tank appeared in our family room. The tank is basically a 180-gallon, but built slightly taller and wider so the water volume comes out to be around 225 gallons. Our house didn't afford the space for a dedicated equipment room, so everything was initially housed under the stand. That quickly changed as I plumbed through the floor and expanded the system into the garage. 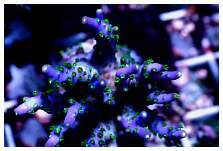 This is where I am fortunate to have a supporting wife who puts up with my reef addiction. 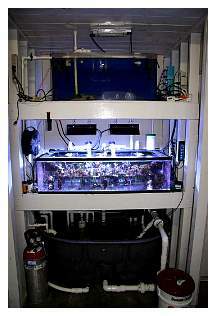 The display overflows into a 40-gallon sump under the stand. 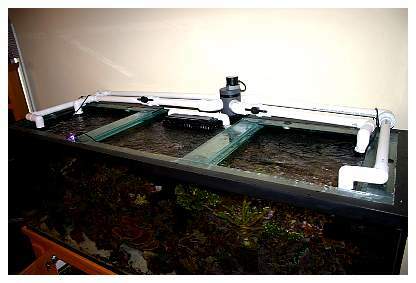 The return pump sends water back to the display, as well as to a 30-gallon refugium that overflows into the sump. The sump under the stand drains through the floor, into the crawlspace, and out to a 150-gallon Rubbermaid stock tank in the garage. An Iwaki pump in the garage returns water from the stock tank back to the sump under the stand. 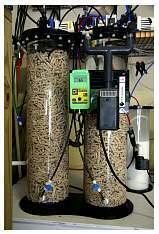 This expansion was originally set up simply to add more water volume to the system, and to provide an easy place to do water changes without carrying water into and out of the house. 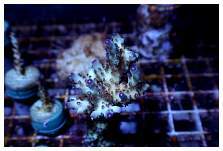 I then got the idea of building a rack enclosure to place a 70-gallon coral fragment tank and a 30-gallon quarantine tank above the 150-gallon stock tank. 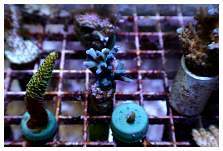 A Sequence pump supplies the coral fragment and quarantine tanks that drain into the stock tank. Expanding the system into the garage was one of the best things I could do. 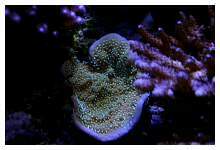 While the display is 225 gallons, adding the sump and refugium under the stand, along with the garage sump, coral fragment tank and quarantine tank (which can be operated online or offline) brings the system's total volume up to around 450 gallons. 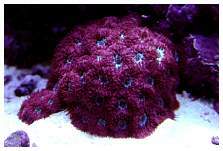 Having that much water supporting a 225-gallon reef has led to rock solid water parameters and has provided a cushion for any acts of idiocy on my behalf. The only downfall to all of this is the look of, "Huh?" 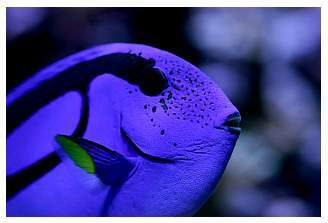 when I explain the setup to the gracious soul who's volunteered to baby-sit the tank when I go out of town. 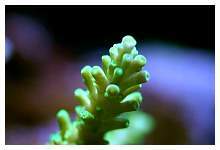 The current refugium has previously existed as an algal scrubber, a coral fragment tank and "pod-ville," depending on my needs at the time. 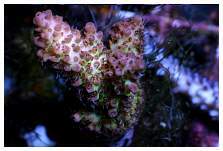 Tons of copepods, amphipods, isopods and mysids are running around in there with no knowledge that they eventually will be sucked into the display to feed the fish and corals. 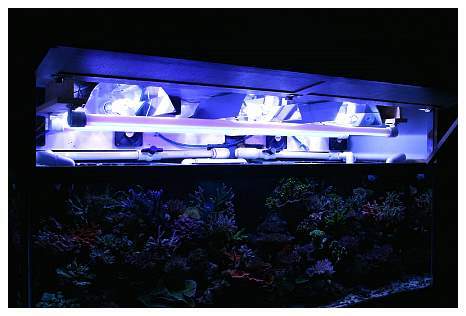 The refugium is lit by a 70-watt 10K double-ended metal halide bulb adapted to a halogen fixture and driven by a simple ballast that was custom-built into a small electrical box. This light is fairly cheap and very effective for its purpose. Like many hobbyists, my quest for the "perfect lighting" scheme almost never ends. 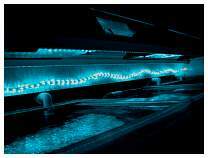 The tank was originally set up with 250-watt double-ended 20K bulbs on HQI ballasts. This combo seemed quite dim, so I then changed to Phoenix 14K double-ended bulbs. I was happier, but the lighting was still not what I wanted it to be. I then decided to step up to 400 watts and used single-ended Radium 20K bulbs powered by PFO HQI ballasts (what some would say are "overdriven"). Sanjay Joshi was coming to visit, and I had to install stronger lighting to impress "the lighting master." I have been very successful with this lighting setup, but even as I write this, another lighting change has recently taken place. I decided to try the 250-watt XM10K bulbs. These bulbs, when powered by m58 ballasts, supply nearly the same PAR as the Radiums I'd previously used, but with less wattage and a more natural daylight look. I probably should have left well enough alone, but I am always pushing for bigger and better, so the main display's lighting was supplemented by two 140-watt VHO actinic bulbs on IceCap 430 ballasts, and another set was added after I decided to run 10Ks. I have tried display photoperiods anywhere from six to 11 hours and seem to get the best results from the halides being on around 11 hours a day. 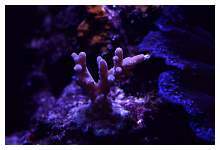 The coral fragment tank is lit by the old 250-watt double-ended setup from the main display and is on a reverse-daylight photoperiod for eight hours. Many thanks to Sanjay and his lighting data/research that constantly makes me wonder about what lighting I should use. 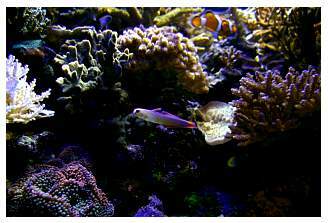 Water flow is a hot topic lately, especially with stony tanks. This has to be the most challenging part of a maturing tank. 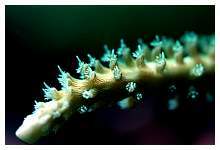 When corals are small, water flow is easy, but as they grow and begin to shield each other, maintaining the necessary water flow can be quite complicated. 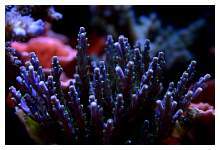 When I started this tank with just small coral fragments, no corals were close to the plumbing outlets. Now, some are directly in the closed-loop outlets' line of fire. 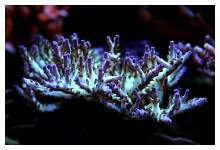 Some corals grow around the flow and some get their tips damaged from the flow. 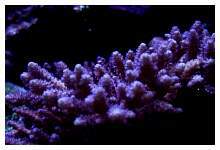 It is very difficult to achieve high flow in the middle of the tank with outlets and corals on the ends. 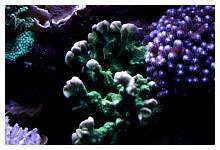 The corals close to the closed-loop outlets are blasted, while corals in the middle of the tank need more circulation. Given all of this I decided to use an OceansMotions 4-way setup with a version 2 drum that allows two ports to be open at once. I have two outlets on each end of the tank served by the ports from the OceansMotions unit. 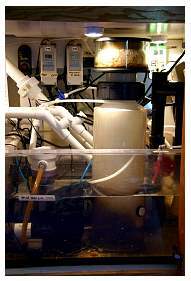 The device allows the flow from a Sequence 5800 pump to sweep the tank left to right, mix, then right to left, mix again and then repeat over the course of a minute. This basically translates into a wall of water moving across the tank in a continuous back and forth motion. It is also like running two Sequence 5800 pumps in a closed-loop configuration but with the price, heat and electrical usage of only one. The mixing between cycles really provides some chaotic current as well. 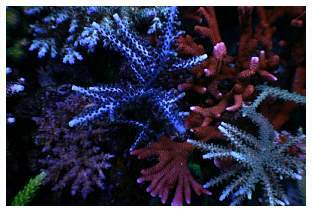 I am very happy with my OceansMotions setup and have variations of it installed on two other tanks I operate. A Sequence 4300 return pump that feeds the display, refugium, chiller and calcium reactor accomplishes additional water flow. 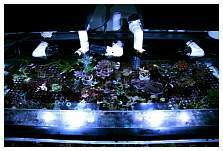 Nearly 1200gph of water flows from the Sequence 4300 through the display and sump. The return and closed-loop pumps are located in the crawl space below the floor for space preservation and noise dampening. 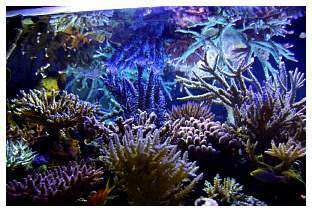 The tank's primary filtration is achieved from the water flow circulating in and around the 150lbs. 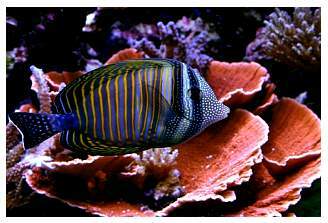 of Marshall Island live rock and over a shallow sand bed one to two inches deep. I love Marshall Island rock for its shape and porosity. 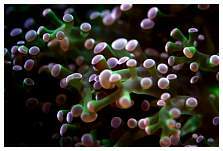 It's pretty cool to look into the rockwork's caves and see all of the sponges and tunicates growing. To me, that is just another sign of a stable, mature system. 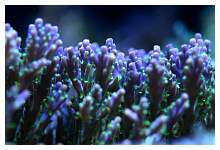 Additional filtration is provided by a modified Euroreef CS83 protein skimmer located in the sump under the stand. I ditched the stock foam filter for a gate valve modification that allows me to fine tune skimmate production. 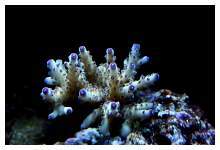 The original pump was upgraded from a Sedra 5000 to a Sedra 9000 to meet the increasing demands on the system as the corals grow. I also run a fluidized chamber with ROWA®phos media for phosphate removal. 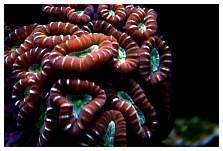 The system's Ca-dKH demand is extremely high since I packed so many stony corals into a relatively small space. 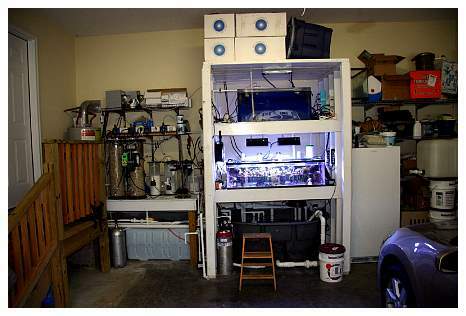 My current calcium reactor is a new beast that was custom-built by Brian Ferguson and contains a lot of Schuran media from FinsReef. It is a dual 8" x 30" reverse-flow reactor built much stronger (¼" cell cast) than any reactor I've ever used. 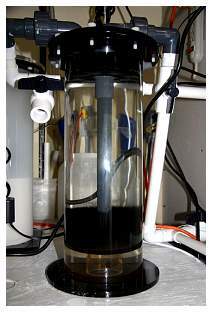 I run all of my top-off water through a Precision Marine kalkwasser reactor. The kalkwasser reactor and calcium reactor do a pretty good job of providing rock solid Ca-dKH readings for the system. 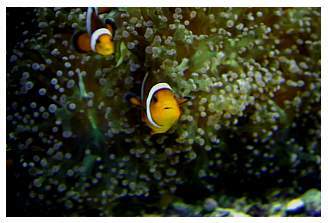 I think monitoring is where the geek side of reefkeeping comes into play. 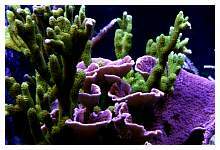 If you are the type who has to have a device that will take tank readings and send you tank updates via text messages on your cell phone, you might be a reef geek. All joking aside, the Aquacontroller 3 from Neptune Systems is a wonderful device to give you a little peace of mind while you are away from home. Well, either that or a heart attack when it sends you a message saying there is a power failure and you are 500 miles away! I've not yet employed it for controlling various parts of the tank, but I love its monitoring/alerting capabilities. 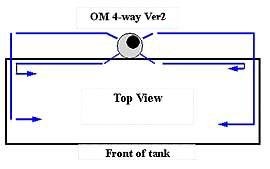 Controlling the tank is done with several separate devices. An Aqualogic dual-stage temperature controller runs the heaters and the one-third horsepower Aqualogic chiller. Another single-stage temperature controller will shut down the lighting if the tank reaches 83°F (meaning the chiller has failed for some reason). Two inline pH controllers monitor the tank's and the reactor's pH to keep the system's pH from getting too low and to keep the media in the reactor from melting down. Another pH controller runs the float switch that controls top-off water additions. This pH controller will shut down the top-off system if the kalkwasser raises the system's pH reading above acceptable levels. Yeah, I love backup/redundancy. I feed frozen Mysis, a homemade blend based on Eric Borneman's recipe, and various flake foods on an alternating basis one to two times per day. 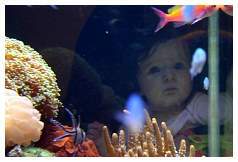 The fish are offered a nori sheet at least twice a week. 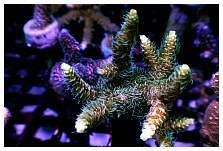 Some would think that I feed a lot, but I've found a high-import / high-export system to yield much better results in coral color than just a high-export system alone. I came to the conclusion around Dec '05 that I was running my system too sterilely. I changed that and have been happier since. I feel like I am always tweaking the system in some way or another. 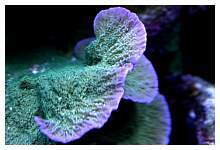 Outside of projects such as building a rack system for the coral fragment tank, moving the chiller from the garage to the back patio or installing a stronger closed-loop pump, regular maintenance of the tank isn't too laborious. 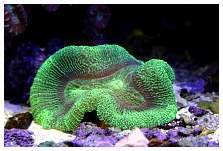 I typically run the algae magnet across the glass once a week. The skimmer's cup and neck are cleaned every two to three days. Water changes of roughly 90 gallons are performed at least monthly and sometimes more often, depending upon how the system looks. 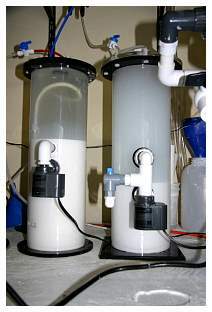 When performing water changes, the sumps are also siphoned, the ROWA®phos is changed, the kalk powder is replaced and salt creep is removed. 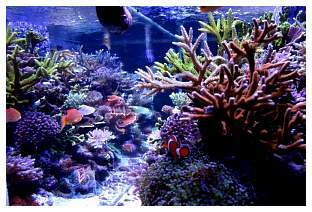 Otherwise, I perform the once or twice a year tasks such as replacing bulbs, cleaning pumps, adjusting timers, replacing calcium reactor media, etc. I currently have a pretty heavy fish load, which is afforded by the extra water volume that was added to the system. A few months ago I added a dozen damsels. 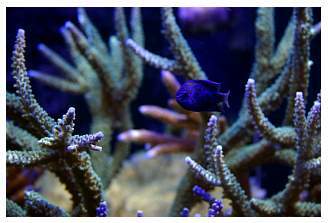 Damsels generally get a bad rap, but watching them swim in and out of the coral branches is the most natural thing about this tank. 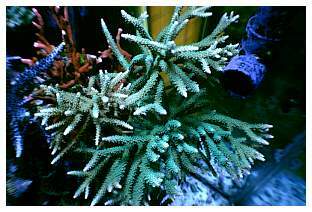 The tank you see before you today is the result of a stony addict setting up a new tank. 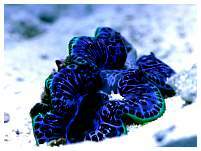 It contains way too many species to list. 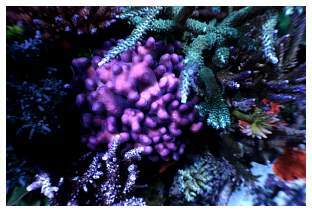 At one time I think I counted around 80+ coral species in this tank. 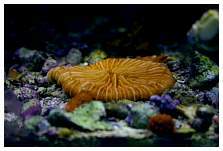 As mentioned in the water flow section, now that the corals are maturing, circulation is becoming more and more of a challenge. 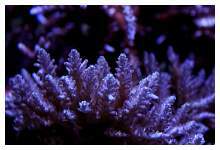 Real estate is becoming an issue, too, as the need to fragment corals is becoming more frequent. 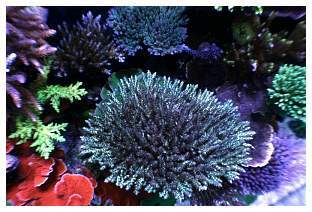 I have had corals grow into each other on several occasions. 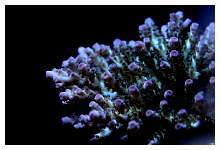 So far, there have been no casualties, but I have seen touching corals trade color pigments between them. 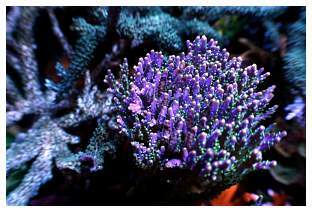 I would love to set up a much larger system and move these corals into it without adding any more, thereby allowing my reef to continue to grow, but on a much larger and more spacious scale. 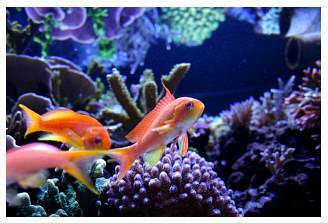 I am sure this dream will come to fruition someday, but not any time in the near future, as my current home won't allow a larger display tank. told ya I was an addict. I couldn't name just a couple favorites. 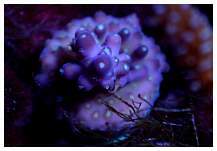 Some of my favorites include rare colorful pieces, and others are just large mature corals that have been with me a while. You know, the ones that have seen the blood, sweat and tears. 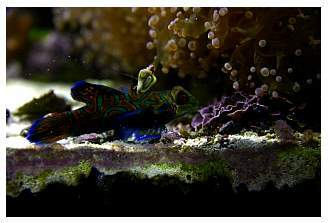 The tank has a standard mixture of Astraea, Cerith, Nassarius and Margarita snails. 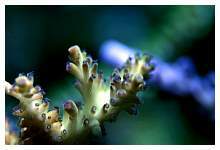 Years ago I acquired some Strombus maculatus from Indo-Pacific Sea Farms. These are great little snails; their reproduction rates, combined with their small size, make them great members of the clean-up crew. 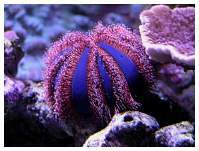 Additionally, the tank is home to Tridacna crocea and T. maxima clams, along with a beautiful royal blue and red Tuxedo urchin. 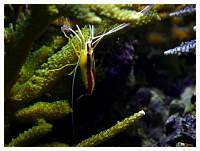 There is a trio of Scarlet cleaner shrimp, and a renegade crab that I tried to kill countless times until I realized it wasn't hurting a thing. 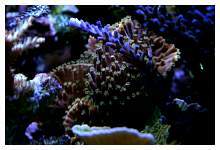 A lot of folks who visit want to see the coral fragment tank just as much as the display. I thoroughly believe in spreading fragments among hobbyists because this was how my tank was filled. 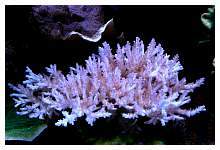 As mentioned before, I have to prune the corals in the display very frequently, so the coral fragment tank is usually full. I also know quite a few hobbyists who want to trade fragments, so my collection continuously grows. 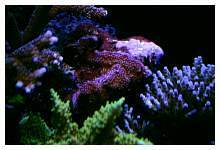 There are several pieces in this tank that I would love to have in the main display, but simply do not have the room for them. I still hang onto them for that "next tank down the road." I need to quit rambling and start thanking some people. First, I would like to thank God for placing the many creatures upon the Earth so that we may enjoy them. I hope that we all become better stewards of our environment so that generations after us will be able to marvel at the natural world around them. I would like to thank my wife for allowing my hobby to persist and even to become a part of her life. She may not know all of the technical information behind the setups, but her care and concern for the animals is second to none. For those who nominated my tank to be honored, and for those who received those nominations and further, thought it was a good idea to feature this tank, my gratitude abounds. I'd like to acknowledge my online buddy, Skilos, who helped make a lot of this possible. Finally, if I may, I'd like to dedicate this honor to my daughter, with whom I look forward to many years of sharing this wonderful hobby. 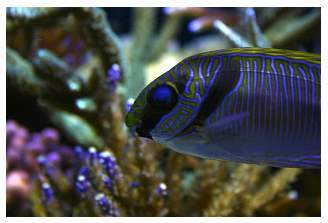 For more information, visit www.KipsReef.com.